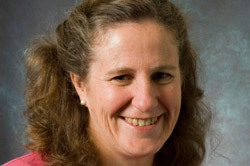 La Trobe academic, Mary Anne Noone, has been awarded the prestigious Access to Justice Award in the recent Law Institute of Victoria (LIV) Legal Awards 2009. Mary Anne was recognised for her longstanding contribution to the legal profession, both as a leader, and for helping the poor and disadvantaged seek legal assistance. She has over 25 years experience at both a practical and policy level. At La Trobe, Mary Anne is an Associate Professor in the School of Law, and is the co-ordinator of the School's Clinical Legal Education Program and the Public Interest Law Postgraduate Program. Her research interests include access to justice and the delivery of legal services, the Australian legal aid system, legal professional responsibility and dispute resolution. Outside of La Trobe, Mary Anne's many roles include: a director of Victoria Legal Aid for over ten years; a member on the West Heidelberg Legal Service committee of management; and a board member of Carers Victoria. The Access to Justice Award is one of twelve President's Awards, which represent the most esteemed category of the LIV Legal Awards. These awards honour outstanding achievements that benefit the community, within Victoria's 14,000 lawyers.